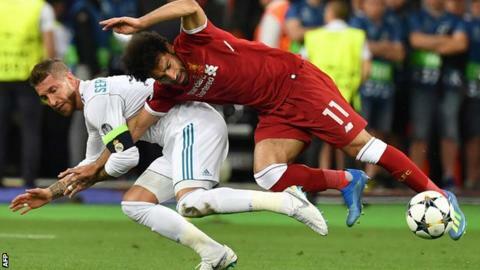 Mohamed Salah's injury in Liverpool's Champions League final defeat is "serious" according to Jurgen Klopp, but Egypt are confident he will be fit for the World Cup. Salah left the pitch in tears after being pulled down by Real captain Sergio Ramos in the Reds' 3-1 defeat. "It's a really serious injury," said Klopp. "He is in the hospital for an X-ray. It's either the collarbone or the shoulder itself. It doesn't look good." But the Egyptian FA tweeted that Salah had his X-ray, showing he had a "sprain in the shoulder ligaments" and that it was "optimistic" he would be fit for the Russia tournament, which starts on 14 June. Salah, who has scored 44 goals for the club this season, tried to carry on after the incident in the 26th minute. However, he was forced to leave the pitch a few minutes later and was replaced by Adam Lallana. How did you rate the players in the Champions League final? Ramos later sent Salah a message of support, posting on social media: "Sometimes football shows you its good side and others the bad. Above all we are fellow pros. Get well soon, Salah. The future awaits you." The 25-year-old has enjoyed an excellent first season at Anfield after joining from Roma for £34m last June. Salah was leading scorer in the Premier League with 32 goals as Jurgen Klopp's side finished fourth in the table - the record for most goals in a 38-game season. Liverpool had nine shots with Salah on the pitch in Kiev and none in the remainder of the first half after he was subbed off. Real Madrid were also forced to make an early substitution after defender Dani Carvajal seemed to hurt himself while trying a backheel. The Spaniard was also in tears as he left the pitch to be replaced by Nacho. Honestly, I think it's a nightmare. There are no words to describe it. There was a minute of silence after we'd seen Salah go down and then when he went down the second time, we knew it wasn't good and that he would leave the pitch. No Egyptian wanted to see that happen, we've never had an Egyptian in the Champions League final. It's really sad - I can't find the exact words to describe it. Some people were in tears. I hope it won't affect his World Cup chances. He's the greatest player in Egypt's history, we haven't reached the World Cup for 28 years and we're just too close for all of our dreams to be shattered.